The global palm oil sector faces ongoing threats to sustainability caused by deforestation, peatland development, labor rights violations and land right conflicts. 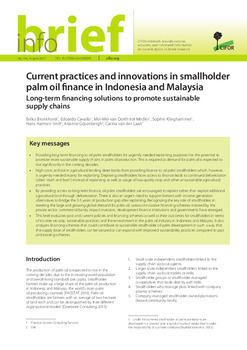 Additionally, integrating smallholders into sustainable palm oil supply chains continues to be a challenge for the industry. 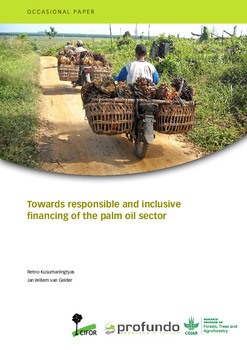 Financial service providers (FSPs) could play a role in stimulating sustainability commitments from the palm oil companies they finance. Their potential influence stems from their capacity to set environmental, social and governance (ESG) conditions for financial services. This research shows that European and US FSPs are further along than their counterparts in Asia in adopting policies that include ESG risk assessments as part of the process for providing financial services. 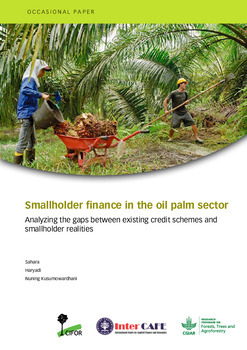 However, attention to smallholder inclusion is insufficient in the policies of all FSPs included in this report. Differences between European and US versus Asian FSPs in adopting ESG standards, as well as the unique markets they finance, present a risk that two parallel but separate financial systems could emerge. Efforts by both government and nongovernmental organizations should emphasize the prevention of a two-tiered marketplace with different quality requirements for palm oil. All actors in this sector still require a significant shift in thinking on the benefits of including ESG standards in cultivation and production processes. 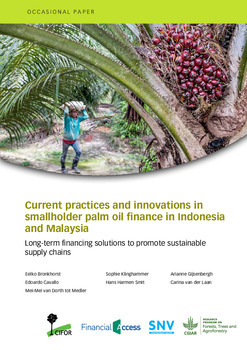 In palm oil producing countries, the lack of specific banking regulations emphasizing sustainability concerns regarding the sector forms a further hindrance to positive developments.